Sometimes, it's the simplest ideas that are the most effective. In the IT production control world, "bubble charts" are a common artifice to show the workflow of various scripts, user/operator interactions, and programs that have to run in sequence, or with dependencies, or a particular time (scheduler), or "on demand". Fair enough, but no news there. 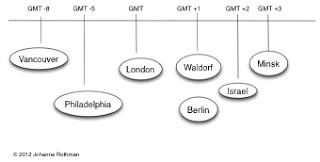 Then I read a blog post by agile guru Johanna Rothman about time zone bubble charts. So simple, but so effective as a communications device for the distributed team. It's a simple image, suitable for the war room or the background on some far flung work station. 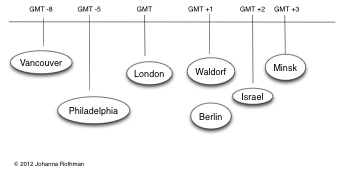 Show the timezone bubble chart to your managers so they understand what you are attempting to manage. Share the timezone bubble chart, so all the team members can participate in selecting planning and standup times. Share the timezone pain. Do not make only one person or only one timezone delegate always arise early or stay late. Know if everyone needs to participate. Ask people if they will timeshift. Make sure you ask in advance, so people can make arrangements for their personal lives. Make sure people either have necessary bandwidth to participate at home or food and beds to participate at work, if they need to participate outside of normal work hours. My experience was [India west coast (UTC +5:30)] to [US East coast (UTC -5)]. That's 10:30 hours difference in time, and not all that uncommon among software teams.